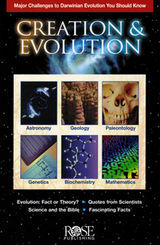 The bestselling Creation & Evolution pamphlet shows how scientific findings in the areas paleontology, genetics, biochemistry, astrophysics and mathematics cannot be explained by Darwinian Evolution. The full-color glossy pamphlet reveals the basic lack of proof surrounding Darwinism and delves into the exciting recent findings. Teachers, parents and students will appreciate how the pamphlet takes challenging subject matter and makes it easy to use and understand.